I want to so desperately start a new project, but if I don't finish these current projects they will just haunt me all summer long. So I am doing forced knitting, not my favorite kind of knitting. Above is a hat I started a couple of weeks ago. I am using two different yarns and creating the pattern as I go. I have no idea who it's for. Could be me, or anyone! Here is the project page. In the background is my sweater that I posted about yesterday. I have the first sleeve nearly done! My socks from last week are at the heel flap stage. I'm still reading Major Pettigrew's Last Stand. It's a pretty entertaining book. I really like the main character and his aside remarks to the town's people. He has a dry sense of humor that makes me smile. I also started Operating Instructions by Anne Lamott. I'm not too far into the book. I tend to read one book at a time. I know about those haunting projects!!! You'll feel great when they're done though - I'm in the bizarre position of having NOTHING on my needles today - it feels very strange and rather liberating! Good for you in finishing up past projects. I have a feeling your basket won't be empty too long. :) I have two projects already going and found myself looking a patterns and yarn to start a new sweater! Sticking with uninspiring projects is hard, but necessary sometimes. Hope you get to something fresh and exciting soon! I have so many projects in progress. I just let them sit there and mock me as I go on my merry way. I wish I had your fortitude! Your conscientiousness is inspiring! Love the colours of the hat. Can't wait to see it finished. I know when I get bored with a project I tend to cast on another. I think I've only got 3 knitted and 1 crochet project going right now. That way I can switch between them and it doesn't feel to forced. However, I do feel like I'll never get them finished. I love the colors you've chosen for your hat. It looks so soft and warm! Is Major Pettigrew's Last Stand about an older man that falls in love? I think I read about it somewhere. Can't wait to see the finished sweater! Your projects are so pretty! I tend to do that too...cast on for another project when I get bored with the one I'm working on. Then make myself finish at least one before casting on for ANOTHER new one. There's just so many things I want to knit and not enough time in the days! I've had to give myself "permission" to start new projects, but I'm trying to finish an old one, then start a new one, and alternate btn. UFOs that way. I can't wait to see how your hat turns out! Loving those yarns together! I'm going to have to do some forced knitting...I've been cheating on my sweater. I'm so fickle :) I think I'm going to go look Major Pettigrew up. He sounds quite entertaining. It's hard to imagine that hat as a forced knit.. it's beautiful. I'm really, really trying hard and be disciplined on not starting a knitting project when the other isn't done. I tend to have lots of sewing going on, so it might get lots in all the projects one day! That hat is very pretty! Knitting monogamy can be tough! You are an inspiration... I want to start a new project, but not letting myslef until I have fixed the project on the go. Sorry about the forced knitting...that's a bummer. The hat does look like it will be lovely, though! i love that lamott book! well, i love anything by her. enjoy! I hate forced knitting projects too but I suppose they need a little tlc too? Plus, it'll make way for what you really want to do! :) Glad you're enjoying the book - I put it on hold at my library. too much forced knitting is what made me take my extended break from knitting- so beware. although, if you get it all accomplished, you might just be my top personal favorite hero. I'm feeling the same way about lingering projects! In fact, my weekly knitting group has declared war on those projects for the month of April. We are finishing as many as we can and not casting on anything new! I enjoy books that 'entertain' so I just might need to add this one to my queue! can you not make the hat karen? 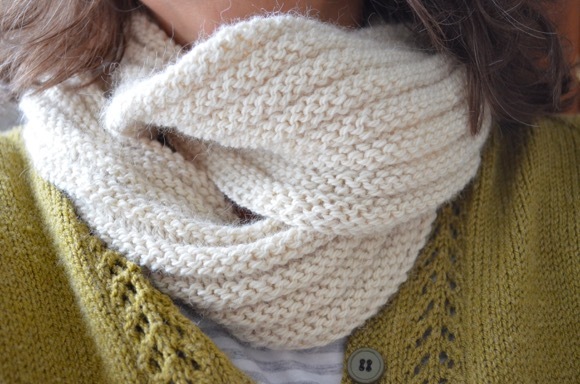 do you mind unraveling and saving that pretty wool for something you'll love to knit instead? thank you for all the great book recommendations too, i'm keeping a list for the summer! Forced knitting is no fun! Since the hat is for noone in particular, maybe unravel and start on something pretty for yourself! :) The Anne Lamott sounds like something I would really enjoy! The colors of your hat match your header so well today! The yarn blends look really interesting...sorry about the forced knitting, been there- takes the fun away. That book has a super title- sounds good. So many tempting projects. I find the last stretch of any knitting hard going. I'm usually dreaming about the next project. Bah! Forced knitting is never my favourite either, but it's so rewarding when it's finished. I know all about UFO's and wanting to start another one! I completely understand. 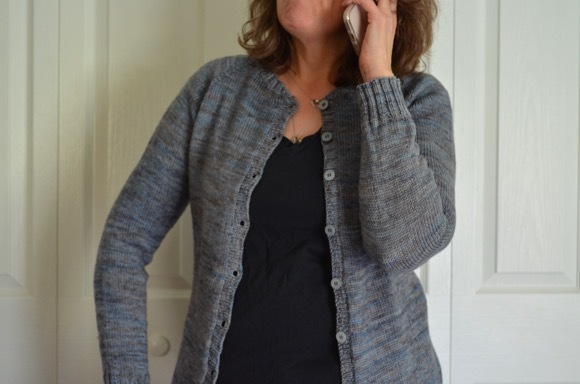 I started off such a strict knitter oone project at a time (very disciplined! )then something happened and now I have many(many) ufo's! Your hat is beautiful! I love the colors. What pattern is it? I hope you keep us posted on it(and your sweater). Both our books look very entertaining- they will be on my TBR list for sure!! ooh--I hate forced knitting, too, but it's so great to finish those projects and then have the freedom to knit anything you want without guilt! You know how I feel! I love projects for my friend, but I'm at the point where I just want them done. Good luck! Love the hat! I love finishing projects but I love all the possibilities of new projects that finishing stimulates more!!! Hope all your finishing goes smoothly and the starting is fun! I head ya! I like to complete what I'm working on before moving on, too. I read an Anne Lamont book years ago - Traveling Mercies I think! The alternating yarn you've chosen is absolutely brilliant. Such a great combination. Your sweater looks wonderful (and it's still cool here -- you could wear it!) and the two different yarns in the hat are wonderful! I started a new project after neglecting my poor shawl for over a week. I've decided that everything is going to start getting equal knitting time! I'm with you on that, too. I cast on for a sweater for next fall only because I am so very close to finishing my socks.